Today Intel announced their earnings for Q1 of their 2017 fiscal year, and the results were good. Intel delivered record revenue for the quarter, of $14.8 billion, up from $13.7 billion a year ago. Intel is a company that loves their margins, and they were once again over 60% for the quarter, coming in at 61.8%, which is 2.5 percentage points higher year-over-year. Operating income was up 40% to $3.6 billion, and net income was up 45% to $3.0 billion, which resulted in earnings-per-share of $0.61 for the quarter, also up 45% from a year ago. This is even though Q1 2016 was 14 weeks, versus 13 weeks in 2017. Intel’s Client Computing Group continued to have gains, with revenue for the quarter up 6% to $7.976 billion. Significantly for Intel, operating income for this segment jumped from $1.885 billion a year ago, to $3.031 billion this year. While we’ve seen the company forced to slow down its movement to smaller processes, the current 14nm node has been well refined and the Kaby Lake processors have been solid performers. The next generation 10nm node is looking very promising though, with Intel claiming 25% better performance and 45% lower power consumption versus Kaby Lake thanks to the density improvements. The Data Center Group also had gains, with revenues up 6% year-over-year to $4.232 billion, although the growth has slowed somewhat. Operating income for the group was $1.487 billion for the quarter, down from $1.764 billion a year ago. This will be an interesting space to watch with increased competition in both the x86 and ARM space, but Intel will be releasing new Xeon chips as well with a change in branding. The Internet of Things Group continued to show gains as well, with revenue up 11% year-over-year to $721 million, and up 35% since Q1 2015, so in two years they have seen some substantial growth in this segment. Non-Volatile Memory Solutions Group had the largest jump in revenue, with revenue up 55% to $866 million. However, this group also saw an operating loss increase to $129 million, compared to a $95 million loss a year ago. This should be an exciting segment to watch though with Intel bringing their Optane products to market, with both the DC P4800X SSD and Optane caching memory. If you haven’t checked out those reviews yet, they are well worth the read, and 3D XPoint definitely brings some advantages even on a Gen 1 product. 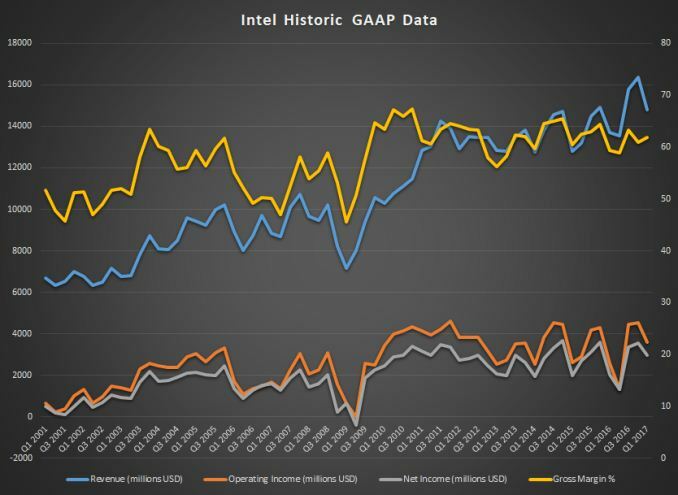 Intel’s Security Group is showing its final mention in their earnings, since Intel’s divestiture of the group closed on April 3, 2017, and subsequently it will fall in to the “All Other” category starting next quarter. Revenue for this group was pretty flat, at $534 million, compared to $537 million a year ago. Operating income was up to $95 million though, from $85 million last year. The Programable Solutions Group, which is Intel’s FPGA segment, had a revenue increase of 18% to 425 million, and an operating income of $92 million, compared to an operating loss of $200 million a year ago. Finally, the All Other category had revenues of $42 million and an operating loss of $1.082 billion. Looking towards next quarter, Intel is forecasting revenues of $14.4 billion, plus or minus $500 million, and a gross margin around 62%, give or take a couple of points.